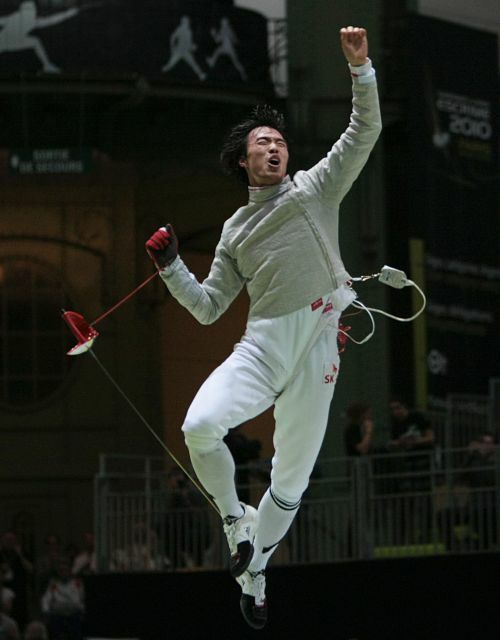 PARIS (AFP) South Korean fencer Won Woo-young made history on Saturday when in the imposing grandeur of the Grand Palais in Paris he became the first non-European man to win the sabre gold at the world championships. The 28-year-old, the world bronze medalist in 2006, dominated defending champion Nicolas Limbach of Germany 15-9 to seal his country’s first world fencing title. Although the Olympic gold in Beijing was won by China’s Man Zhong the world title has always been held by one of the European fencing superpowers. But after beating Italy’s Luigi Tarantino in the quarterfinals, Won gained confidence, giving Limbach no chance in the final. The Korean at one point led by 10 points before fighting off a late rally by his 24-year-old German opponent. Romania’s Cosmin Hanceanu and Veniam Reshetnikov of Russia shared the bronze.